the perception of two images of a single object; called also double vision. binocular diplopia double vision in which the images of an object are formed on noncorresponding points of the retinas. crossed diplopia horizontal diplopia in which the image belonging to the right eye is displaced to the left of the image belonging to the left eye (divergent strabismus). direct diplopia horizontal diplopia in which the image belonging to the right eye appears to the right of the image belonging to the left eye (convergent strabismus). horizontal diplopia diplopia in which the two images lie in the same horizontal plane, being either direct or crossed. vertical diplopia diplopia in which one image appears above the other in the same vertical plane. The condition in which a single object is perceived as two objects. /di·plo·pia/ (dĭ-plo´pe-ah) the perception of two images of a single object. crossed diplopia diplopia in which the image belonging to the right eye is displaced to the left of the image belonging to the left eye. direct diplopia that in which the image belonging to the right eye appears to the right of the image belonging to the left eye. horizontal diplopia that in which the images lie in the same horizontal plane, being either direct or crossed. monocular diplopia perception by one eye of two images of a single object. torsional diplopia that in which the upper pole of the vertical axis of one image is inclined toward or away from that of the other. vertical diplopia that in which one image appears above the other in the same vertical plane. double vision caused by defective function of the extraocular muscles or a disorder of the nerves that innervate the muscles. It occurs when the object of fixation falls on the fovea in one eye and a nonfoveal point in the other eye or when the object of fixation falls on two noncorresponding points. Also called ambiopia. Compare binocular vision. Double vision. The perception of two images of a single object. This occurs in squint (strabismus) when both eyes are not aligned on the object of interest. Diplopia with one eye is rare but possible. The medical term for seeing double. The condition in which a single object is seen as two rather than one. This is usually due to images not stimulating corresponding retinal areas. Other causes are given below. Syn. double vision (colloquial). See differential prismatic effect; haplopia; myasthenia gravis; retinal corresponding points; polyopia; multiple sclerosis; strabismus; diplopia test; triplopia. binocular diplopia Diplopia in which one image is seen by one eye and the other image is seen by the other eye. crossed diplopia See heteronymous diplopia. heteronymous diplopia Binocular diplopia in which the image received by the right eye appears to the left and that received by the left eye appears to the right. In this condition the images are formed on the temporal retina. Syn. crossed diplopia. homonymous diplopia Binocular diplopia in which the image received by the right eye appears to the right and that received by the left eye appears to the left. In this condition, the images are formed on the nasal retina. Syn. uncrossed diplopia. incongruous diplopia Diplopia present in individuals with abnormal retinal correspondence in which the relative positions of the two images differ from what would be expected on the basis of normal retinal correspondence. Example: an exotrope experiencing homonymous diplopia instead of heteronymous diplopia. Syn. paradoxical diplopia. See abnormal retinal correspondence. monocular diplopia Diplopia seen by one eye only. It is usually caused by irregular refraction in one eye (e.g. in early cataracts, corneal opacity) or by dicoria or polycoria. It may be induced by placing a biprism in front of one eye. See ghost image; luxation of the lens. paradoxical diplopia See incongruous diplopia. pathological diplopia Any diplopia due to an eye disease (e.g. proptosis), an anomaly of binocular vision (e.g. strabismus), a variation in the refractive index of the media of the eye (e.g. cataract), a subluxation of the crystalline lens, or to a general disease (e.g. multiple sclerosis, myasthenia gravis). See exophthalmos; luxation of the lens. physiological diplopia Normal phenomenon which occurs in binocular vision for non-fixated objects whose images fall on disparate retinal points. It is easily demonstrated to persons with normal binocular vision: fixate binocularly a distant object and place a pencil vertically some 25 cm in front of your nose. You should see two rather blurred pencils. The observation of physiological diplopia has been found to be useful in the management of eso or exo deviations, suppression, abnormal retinal correspondence, etc. (Fig. D4). See Brock string; retinal disparity. diplopia test See diplopia test. uncrossed diplopia See homonymous diplopia. 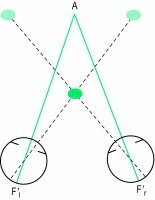 n seeing a single object as two images. May occur after fracture of the bony orbital cavity as a result of displacement of the globe of the eye inferiorly. seeing two images; double vision. A. Double vision, or diplopia, as it's called, may be due to many conditions, including disorders of the muscles of the eye (extra-ocular muscles) and the nerves controlling them, disorders of the eye ball (enlarged eyeball as in Graves' ), and sometimes disorders of vision. Diplopia may manifest important conditions, so consulting a doctor (e.g. neurologist or ophthalmologist) may be wise.